The bigger the better is the scenario right now and it’s even in the case when it comes to TVs. TVs screen is also getting bigger and bigger these days and they are even getting better in picture quality and digital technology. Comparing them to watching digital multimedia content over laptops would not be fair enough and even when you compare them to small display iOS device. It’s like the competition between an elephant and ant, where there could be one sided win for elephant but in some scenarios ant can very well compete better than the rival. Well here the competition is not of which one is the best but it’s the matter to find alternative of TV on iOS device. Today I have come up with the fabulous apps which can convert your iOS device, be it a iPhone, iPad or iPod touch to a small TV, which no doubt will not be able to compete with the charisma of big screen and digital display but will provide a satisfactory alternative to big screen. This app is perfect while you are away from your home or in unavailability of TV set without especially on the travel or trip. So without taking much of your time, lets head on to the top 5 apps to convert your iOS device into a small portable TV, where you can conveniently have a small fun. Hulu is a website which enable you to watch entire seasons of old show or even the current season episodes which you might have missed. Hulu+ is basically an app for iOS devices which exactly work like a browser and it allows you to watch featured videos, mainly the clips from the last night shows, comedy series and drama. You can even look for your favorite video by simple search. You need monthly subscription for accessing the features of this app and you can download this app from here. NetFlix is another fabulous iOS device app which converts your device into a small size walking TV. The subscription to this app will enable you to watch wide range of movies and TV shows. You can easily search the clips and can even pick something from the items listed in instant queue. This app is quite intelligent and it tries to deliver movies and shows by adapting your interest. TV shows are sorted by season and episodes and you can watch them in the instant queue with single tap. You can download this app from here. Crackle is another impressive app which is most importantly a free app and you can get the taste of classic for free. 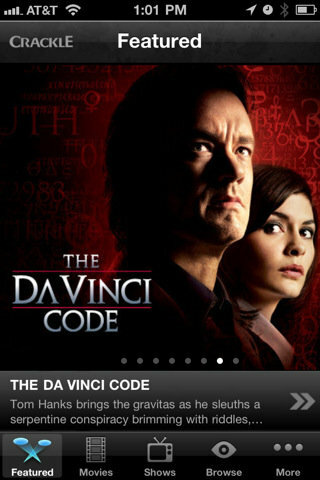 It’s a free app for iOS devices from Sony Pictures Entertainment which includes selection of free movies and TV shows. You don’t need the monthly subscription but you need a Crackle account registration to watch your favorite videos and movies. You can even log with your facebook credentials. It’s a fun app for the entertainment on the go. Download Crackle. 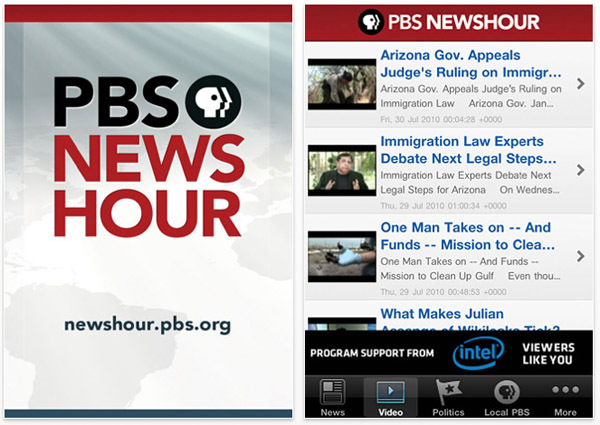 PBS is another interesting app to bring much of the educational, art and entertainment stuff on the small screen iOS devices. Right from educational clips to the Roadshows, great performances and full length episodes you can watch wide multitude of preview and short clips on this free app for iOS devices. You can check out the schedule for PBS station and can set the reminder for your favorite show on you facebook, email or on twitter account. You can download PBS from here. TV.com is best known for promotional clips; however there is wide range of full length clips in various video segments which you can watch. The best thing again here is that this app is free for iOS and you can enjoy watching high quality of videos with relatively limited edition for free. You can access the features of this app by downloading here. So, which you gonna download to enjoy the TV shows and movies on the go. Do write us about your views on this post and also your favorite App for iOS device. Entertainment apps like these are evergreen in the app markets. People who travel always may be deprived of TV soaps or documentaries and these apps you have suggested will be loved by the moving TV buffs. Small screen and so what? The entertainment of any sort is desired by the loner travelers. Thanks for the app references!